College Station Code Enforcement Supervisor Julie Caler makes her first appearance on the podcast and explains how she and her crew work to keep the city looking good. Sometimes, that means dealing with some odd or difficult situations. In this episode, we cover topics ranging from parking and trash violations to hoarders and goats. 00:45 — What exactly do you and your staff do? 02:07 — Code used to be proactive, then reactive — now what are you? 03:53 — Most-common code issues in College Station? 04:45 — Why no parking in the grass? 06:25 — Most-egregious issues related to trash? 08:25 — How much of a problem is parking in yards? 09:23 — What are your Texas A&M home football game days like? 10:28 — Open storage is…fun? Bedroom suites on the roof?? 13:00 — What about issues in back yards? 14:25 — Boats, trailers and RVs. 14:52 — Weeds and grass. 16:33 — Dealing with hoarders. 22:30 — Jay gives Julie a pop-quiz. Are address numbers required on homes, businesses? Have you ever had a problem finding an unfamiliar home or business? Even with the prevalence of GPS on our smartphones, locating some places remains difficult if the building isn’t identifiable from the street. That can create serious problems not only for visitors, deliveries and service calls but also for first responders in an emergency. That’s why almost all cities, including College Station, have ordinances that require clearly displayed address numbers for homes and businesses. In College Station, the address number for houses must be at least two inches high on both sides of a mailbox near the curb, or at least four inches high on the house or a prominently displayed sign. For businesses, the numbers must be at least four inches high and have at least a half-inch stroke width in the main body. They should also be made of a durable material. The color of the numbers should also provide a contrast with the background. For example, brass or black numbers on a dark background are hard to see from the street, especially at night. In addition, be sure your numbers won’t be obstructed by bushes and shrubs as they grow. If it’s behind a bush and can’t be seen from the street, you’re violating the ordinance. You may occasionally find a flyer on your door from a business that paints address numbers on curbs. The flyers sometimes claim that if you don’t have your address on the curb, you’re violating city ordinance. While it’s certainly not a bad idea to display your house number on the curb, our ordinance only requires it to be on your house, mailbox or a prominent sign on your property. 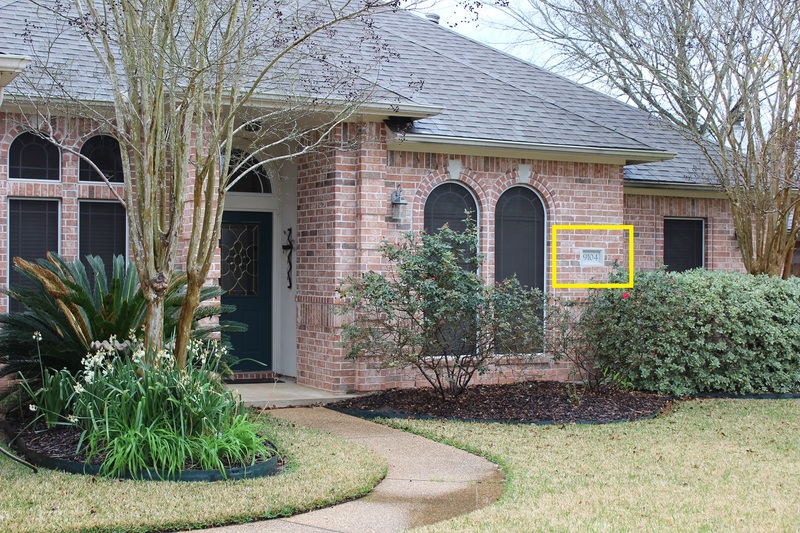 For more information about properly displaying your address, contact Code Enforcement at codeenforcement@cstx.gov.